In addition to Los Piratas, David and I, there will be four new volunteers at Lugu Lake (admitted, Kelly’s been with us this whole time, but she certainly deserves some screen time). Kelly was born and rised in a small village in Jiamusi City, the fourth largest city in Heilongjiang province. Coming from rual China, she would like to devote her effort to the helping children in poor areas learn about the world of music. She will do coordinating and logistics work at the Lugu Lake music camps. 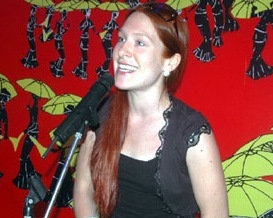 Hailing from Berlin, Germany, Olivia is a citizen of the world and a singing sinologist. She has studied and worked in China for almost 12 years and is currently completing a PhD on Yi (Nuosu) music. At Unity Olivia will be teaching an introduction to music appreciation and theory, focusing on western classical music, jazz, and local folk music. A graduate student of International Politics at the Hopkins-Nanjing Center, Grace’s interest in China began while studying abroad and traveling all over China in 2006. She started piano at age 5 but it wasn’t until she learned guitar for church that she began to appreciate music and musical instruments as a hobby. Grace loves all types of music and this summer, she looks forward to sharing this love with students at the Unity Rural Music Project.